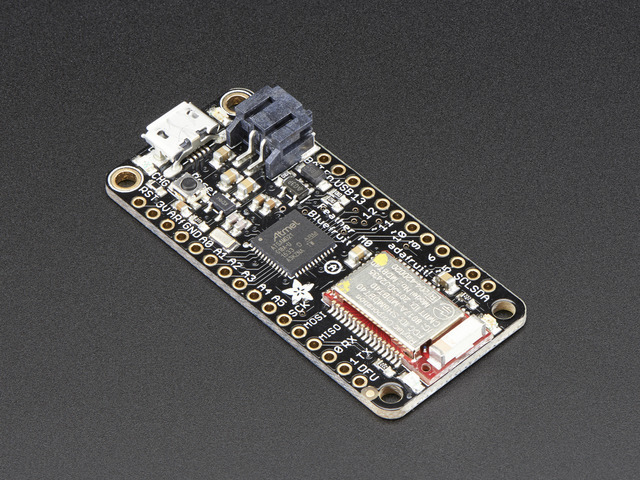 The Feather M0 Bluefruit is chock-full of microcontroller goodness. There's also a lot of pins and ports. We'll take you a tour of them now! This is the general purpose I/O pin set for the microcontroller. #20 / SDA - GPIO #20, also the I2C (Wire) data pin. There's no pull up on this pin by default so when using with I2C, you may need a 2.2K-10K pullup. #21 / SCL - GPIO #21, also the I2C (Wire) clock pin. There's no pull up on this pin by default so when using with I2C, you may need a 2.2K-10K pullup. A1 thru A5 - These are each analog input as well as digital I/O pins. #7 - used as the Bluefruit IRQ (interrupt request) pin. Since these are not brought out there should be no risk of using them by accident! ARef - the analog reference pin. Normally the reference voltage is the same as the chip logic voltage (3.3V) but if you need an alternative analog reference, connect it to this pin and select the external AREF in your firmware. Can't go higher than 3.3V! DFU - this is the force-DFU (device firmware upgrade) pin for over-the-air updates to the Bluefruit module. You probably don't need to use this but its available if you need to upgrade! Check out the DFU Bluefruit Upgrades page for how to use it. Otherwise, keep it disconnected. There's two sets of SWD pins. These are used for program/debug of the two processors on the Feather. The round pads on the right are for the ATSAMD21G18 (main processor). The rectangular pads to the left are for the nrf51822 inside the BLE module. You cannot connect these together to debug both at the same time! The (somewhat deceptively labeled) 'Reset' pad on the bottom of the PCB beside SWCLK and SWDIO is for Factory Reset. Connecting this pad to GND at startup will perform a factory reset, erasing any config settings and may be useful trying to recover a device in a faulty state. Be sure to remove the connection to GND after the first power cycle. This guide was first published on Jan 13, 2016. It was last updated on Jan 13, 2016. This page (Pinouts) was last updated on Apr 24, 2019.